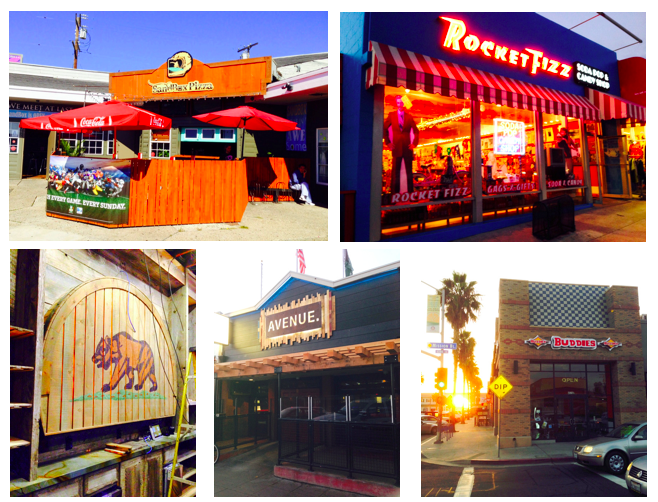 San Diego's rowdy oceanside town of Pacific Beach has recently had a whole host of changes take place in its inundated dining and bar scene. It seemed like many of these developments happened over night, so in order for us to keep track of them, we wanted to document all the developments in one place. Avenue has moved into Plum Crazy's old hot spot at 1060 Garnet Ave. It appears that substantial renovations have been made to the space, including the addition of a bunch of flatscreen TVs and an enhanced craft beer selection. Plum Crazy didn't serve food, and we doubt that a kitchen was added during renovations for Avenue. PB's last remaining Irish bar, Brewley's Pint, is no more. 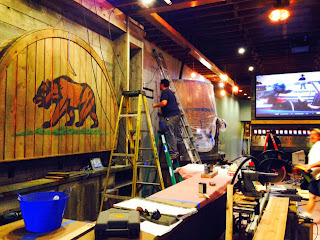 The location is currently being renovated into Barrel Republic, which looks like it's going to be quite the beer bar. From street view, the space was completely transformed and puts off pretty rad vibes already. We're not sure if food will be served (there was no kitchen in Brewley's), but we'll be sure to follow up once Barrel Republic opens. We've heard good things about Kabob Island on 1038 Garnet Ave. The place is simple and unassuming, and based upon walk-bys, gets a good crowd for weekday lunch. They describe the food as 'Mediterranean' (albeit a very overused, non-descript term nowadays) and serve your typical "Greek" items like hummus, shawerma, gyros, and kabob. 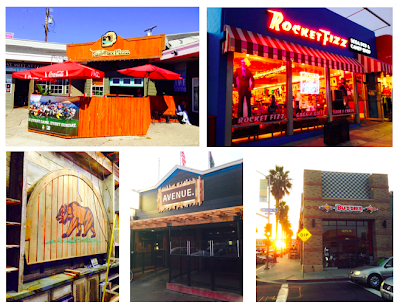 Sandbox Pizza is now open in the corner spot of the small shopping plaza at 1014 Grand Avenue. Previously occupied by The Black Pearl, Aussie Bar, The Australian, and a variety of other names for the same dive bar, the space has since sold its liquor license and is now specializing in pizza and serving fairly standard restaurant food. They are awaiting approval to be able to sell beer and wine and intends to serve over 20 drafts. Right across from Kabob Island sits Lil' Orbits at 1037 Garnet. Although this place looks a bit shady, the proprietor couldn't be nicer and they have been getting some rave reviews from Yelpers, so it may be worth a try. Lil' Orbits offers mini donuts made to order with a variety of dips and toppings so you can customize and create. They're open late to cater to the ravenous bar crowd. Rocket Fizz Soda Pop & Candy Shop has opened a location on 1414 Garnet Ave right next to Papa Luna's Empanadas. 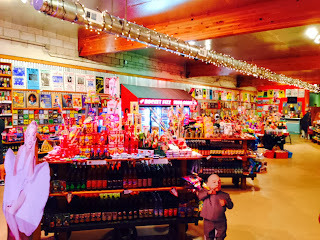 This place is heaven for kids, and with over 35 locations, they have a recipe for success - sugar overload! Buddies Burgers has replaced Fat Burger on the corner of Garnet and Mission and should be opening soon. 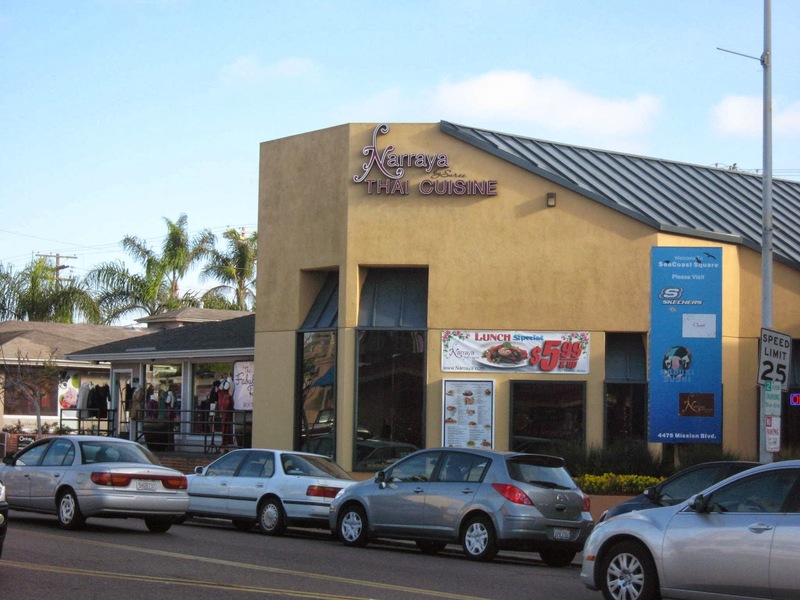 This is Buddies second location in San Diego, and the SDSU location has received positive reviews for their burgers, shakes and stacked sandwiches. In the baristaville that is San Diego, coffee shops need to distinguish themselves from the crowd. Coffee Dolls is doing that by garnering hype, as the PB location on 1419 Garnet Avenue has been under development for pretty much all of 2013. We have no idea if or when they'll ever open. This spot is Narraya no more! The sister restaurant to Amarin Thai in Hillcrest and Siam Nara in Mira Mesa, Pacific Beach's Narraya has unfortunately closed. This restaurant was delicious and beautifully decorated, but apparently too classy for Garnet. When we noticed that they stopped offering their lunch special a couple months back, we knew something was awry. We're sad to see this eatery go! We're not nearly as upset by the closing of Sully's Sandwich Shop on Cass St. This 'deli' would make all their hot sandwiches using a microwave, which is a deal breaker for us, although we did enjoy some of the menu items before finding out how they were 'nuked.' Allegedly, Sully's sandwiches are now being offered at EZ-J's Sandwiches, right up the street at 1088 Garnet Ave. The Tiki House on 1152 Garnet is no more. Known for its live music, cheap drinks and humble appeal, this little space adjacent to PB Mika Sushi couldn't keep up with rent increases and has closed. We never went in but are sorry to see such a landmark close. First they were selling, then they weren't selling, now Moondoggies, a 'staple' of PB owned by Eat. Drink. Sleep. (same owners as Tower 23, Belmont Park, The Dog and more), is allegedly selling, once again. Who knows the real deal? Potts By Patt Flower Shoppe at 1560 Garnet may be turning into a 24 hour diner, according to total hearsay. We hope this one is true as we love diners. Another unsubstantiated rumor is that Nick's at the Beach may have the same fate as the OB version, Nick's at the Pier. The crew behind OB's Wonderland may be taking over the outdated space on 809 Thomas Ave. in the near future. If you ever have information about openings or closings in and around San Diego, bring them to our attention by emailing us at admin@sandiegoville.com.